LOVE! You are a layering goddess! Loving the plaid shirt. These photos are great. Such a lovely view. can't believe you can wear your niece's clothes! 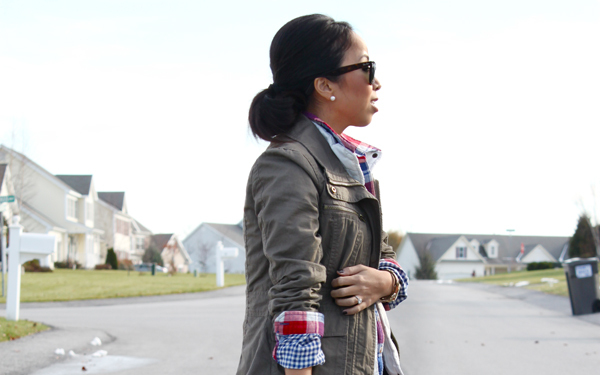 Great layering with this outfit! So casual and cute! Love the way you layer. Excellent job. You are a layering queen! I love your smile and you are so photogenic! Oh! Is that a white puffer vest?! :) I love all these layers! I ADORE your layers, doll. That shirt and jacket are too adorable! Completely adorable and amazing how you borrowed the vest from your niece! You look amazing Khatu - love the military look and the bold accessories! You look casual but very put together...love it! Love this layered look :) gorgeous shirt! Love the blog! Did you go to Hutch Tech? You're such a master at layering! I wish I could pull off this sort of look, but I'm afraid I'd just end up looking like a giant puff-ball, haha! You are a layering queen! You always manage to look so chic and cozy.